Award Winner of the 1989 Penang Durian Competition. This specie originates from Pondok Upeh, Balik Pulau and has a round shaped husk. The orange reddish coloured flesh have very little fiber and are fairly sticky with a bitter-sweet taste. 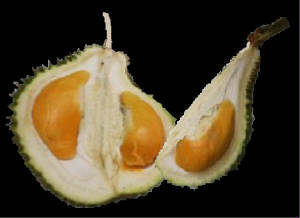 The flesh is soft, smooth with thick pulp, and the seeds are small (mean more pulp). Officially registered on 4 June 1990. Price for Ang Heh (eating at durian farm 2010) ranges from RM$20 to $45 per kg. Many people visit durian farms in Teluk Bahang, Pantai Aceh and Balik Pulau, with the latter the most popular. Many people visit Penang durian farms in Telok Bahang, Pantai Aceh and Balik Pulau from June to August.